Occupy - A worldwide movement. Just check out the map on this website of the people all over the globe that logged into occupywallst.org. It grew exponentially all over the place because the struggle of the 99% is a global one. It is all of us against the oligarchs. At least it is known where he is now. Solidarity with Itai Dzamara and the 99% of Zimbabwe. Zimbabwe: The World is Watching!! Free Itai Dzamara and end the fascism in your country. The EU urged the government to “take all necessary measures to ascertain Mr Dzamara’s whereabouts”, calling for a probe into the disappearance. Morgan Tsvangirai, former prime minister and leader of the opposition Movement for Democratic Change, said his party feared “the worst”, as previous activists who were reported kidnapped were later found dead." Just too sad for words. 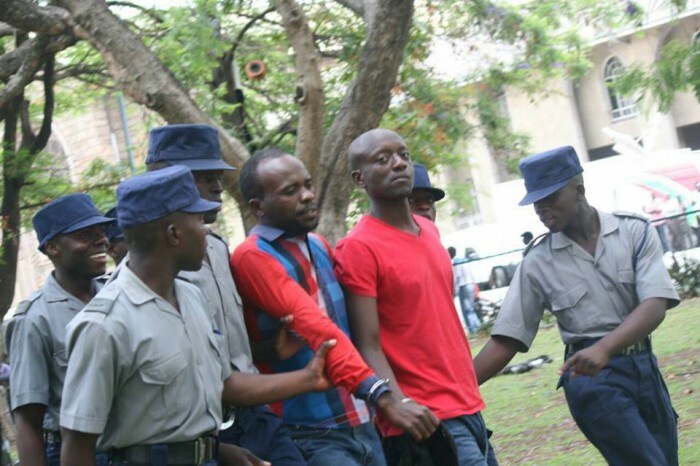 Free Itai Dzamara! The World Is Watching! http://www.aljazeera.com/indepth/features/2015/03/case-disappeared-activist-zimbabwe-150317085340227.html - Solidarity to The 99% Struggle in Zimbabwe. Sadly, Itai Dzamara is still missing. Ohmmmm for his safety. Say "I am Itai Dzamara" - http://www.zimeye.com/itai-dzamara-heavily-armed-british-police-fire-warning-at-zim-embassy/ + http://allafrica.com/stories/201503261549.html Sad to say I'm now fearing the worst. "Canada urges govt to investigate Dzamara disappearance"
In a statement, the Embassy of Canada to Zimbabwe said the government must respect human rights and freedom of the people to express themselves and petition. “Canada remains deeply concerned by the forced disappearance of Zimbabwe human rights activist Itai Dzamara on March 9 2015 and the fact that no light has been shed on his fate or whereabouts to date,” the statement read." I hope Itai Dzamara is safe and that he will rejoin his friends and family I but just can't help but fear the worst - http://nehandaradio.com/2015/04/01/jestina-mukoko-on-itai-dzamara-abduction/ but meanwhile, across oceans back in 'the land of the free' - ''Military and Police in Florida Practice Detaining Citizens'' http://www.thenewamerican.com/usnews/constitution/item/20550-military-and-police-in-florida-practice-detaining-citizens What it to live in a free and just society has to be pondered upon and.. struggled for. Zimbabwe human rights lawyers are suing the government over missing Dzamara and their failure to look for him. What happens in one place happens to us all. Freedom, love, peace and equality for the 99% everywhere. Solidarity lugano! ''Lawyers take govt to court over Dzamara'' - http://www.thezimbabwean.co/politics/75438/lawyers-take-govt-to-court.html ''What happens in one place happens to us all." = The Truth. Solidarity beautifulworld. It really is the GLOBAL 1% (or .01%) that we need to focus on. They are everywhere and they are united in taking down voices against them. So sad for this woman and her children who may never see Itai Dzamara again and may never find out what happened to him. We must stay united everywhere because we have numbers on our side. Re. Itai Dzamara, still ''no new info on missing activist'': http://www.news24.com/Africa/Zimbabwe/Zim-police-say-no-new-info-on-missing-activist-Lawyers-20150423 You're so right in what you say and 99% Solidarity is our solution, wherever we are. People all around the world showed it for OWS and still do. Itai Dzamara is still missing. His family is living in fear. Itai ''Dzamara, a journalist and political activist, disappeared on the 9th of March 2015 and government’s notorious CIO has been blamed for it all.'' - From your link + fyi: http://nehandaradio.com/2015/08/24/full-text-petition-to-mugabe-on-itai-dzamara/ - re.his family's latest attempt to find out what happened to Itai.